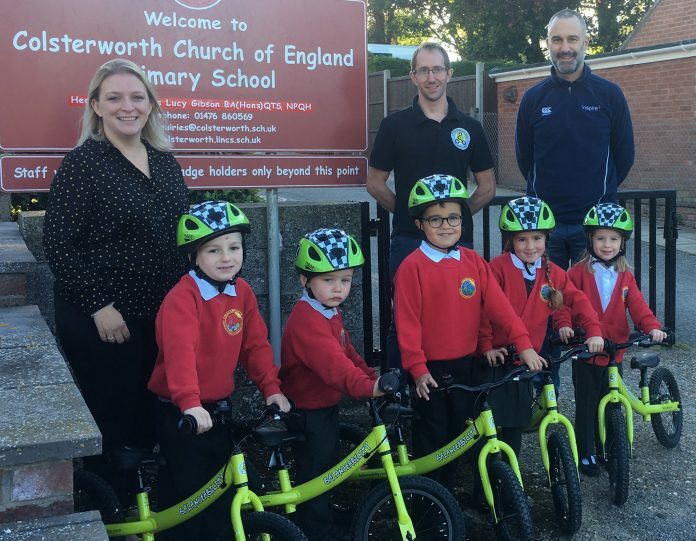 L-R: Mrs Jordan (Deputy Head at Colsterworth Primary School), Benjamin Smith (Balanceability) and Vincent Brittain (Inspire+) with pupils from Colsterworth Primary School. Over 1000 primary school pupils in Lincolnshire will be given the essential life skill of learning to ride a bike thanks to an exciting new partnership. Balanceability, which is part of TTC Cycling, has joined forces with sports charity Inspire+ to supply 24 schools in the area with 10 x 14” balance bikes, 10 helmets and all the training materials required to deliver the UK afPE approved ‘Balanceability’ learn-to-cycle programme. Inspire+ is a sports charity which serves schools across South Kesteven and Lincolnshire.